This was a super fun CAS#23 challenge that was held last week on SCS! I know, I'm a bit slow getting this post up, but I've been on a creative roll and, when on a roll, it's difficult to stop! I'm sure you have that problem too. Right? The challenge was to draw inspiration from Art.com and create a Clean & Simple card. There is SOOOO much to draw inspiration from on this site. I didn't...let me rephrase that...I couldn't stop at just one. I ended up making three different cards in the course of one evening. And, I've bookmarked the site so I can return time and again for even more inspiration. Is it cheating by casing a piece of artwork from some well known artists (or some not so well known)? Absolutely not!! I love how this card turned out! Here is the original artwork, Night Blossoms by Cristina Pepe. So very simple to create. I started with a 5-1/4" x 4" piece of Soft Suede card stock. I sponged on some Soft Suede and Melon Mambo. The sponging just adds some depth to the project. I stamped the floral branch from the Thoughts & Prayers set in Chocolate Chip. Then, using my Stamp-A-Ma-Jig set slightly off to one side, I re-stamped the image in Whisper White Craft ink. This technique is known as Shadow Stamping. I dried the ink completely and rubbed my Embossing Buddy over the entire card stock. I inked up only the blossoms with my VersaMarker and, again, set my Stamp-A-Ma-Jig slightly out of alignment and stamped the image. 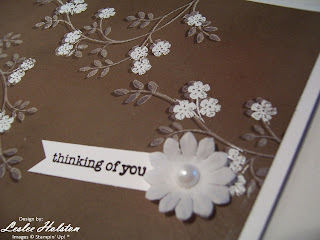 I embossed using White Embossing Powder and heat tool. This is what made the flowers look as if they are popping off the card. The sentiment is from Teeny Tiny Wishes (I'm loving this set...it has everything). The flower and half back pearl is found in the Pretties Kit. 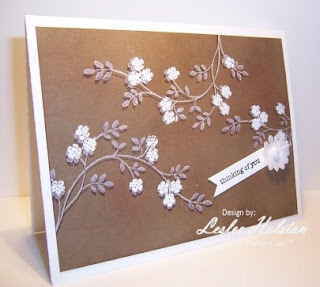 It is all layered onto a Whisper White card base. Remember, when using pigment inks (Craft inks), drying time will be longer than if you used the dye based inks (Classic inks). You can speed this process by setting your heat tool to it. I love the outcome. And, believe it or not, it took under ten minutes to complete. Yes, I used my heat tool. How do you like it? Thanks for stopping by today. I hope you'll give Art.com a try the next time you need a little creative inspiration. I'll be posting my other art inspired cards in the next day or so. Come back soon!